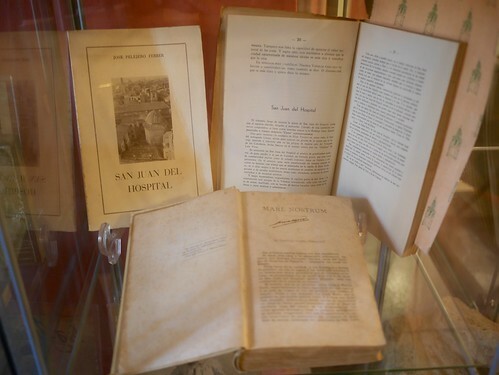 Currently you can visit the Exposure Fund File documentaries and Bibliographical dand the Foundation of Valencia "Conjunto San Juan Del Hospital"
Place: Findings showroom Site Museum "Set H. San Juan del Hospital in Valencia ". El montaje de esta Exposición ha sido llevado a cabo por Carlos Llorens -que nos ha ayudado muchísimo-, with always available Omar. And the voluntary presence of attention to it Silvia, Alba, Rosa, Emilio and Paul. In 1966 Archbishop Olaechea gave the abandoned temple of San Juan del Hospital Valencia to priests of Opus Dei, to return to the worship of the Church. In the room there was nothing. If we ignore the film screen and seats Sare, that had become the venue during the previous decade. In the early days of the year 1967, university young volunteers, They began the task of cleaning and conditioning the interior of the church, to inaugurate the day 24 of June, festivity of San Juan Bautista. And for the first time the monument spoke. Under the old layers of paint scratched he appeared a talking sign, a brand stonework, the signing of a century guild carved stone or put in place. That was the beginning, the distress call of an ancient building very specific purpose: the Joint Hospital of St. John of Jerusalem, "Ospedale" first city recovered, Cemetery campaign headquarters image carved in stone and brought by the hosts: Nuestra Señora del Milagro. And now forever a dialogue was established. Why are Labras? Why the picture has its desubicada chapel? And the arches ...? Thus began the search for information. libraries, records, personal testimonies, stories or legends, it was helpful. The first rector of the church, D. Salvador Moret was a tireless promoter of all. The Directorate General of Fine Arts and the Ministry of Culture advised the reclamation works. So it was learned that the entire precinct was declared National Historic Monument -artístico character from 1943. During 50 years has been collecting a lot of information and has been Applying to the restoration of the complex. In 1996, with the help of the European Commission on Culture, in collaboration with specialists from the University of Valencia and the Ministry of Culture, a thorough historical study that culminated in the realization of the Director of the Temple and dependencies of San Juan del Hospital Plan was carried out. And so, they were just a babbling became an endless conversation. The archivists and archaeologists took care of this. The enclosure was declared in April 1997, Site Museum. Foundation C. V. "Conjunto San Juan del Hospital" keeps on file-library and bibliographic documents and archaeological evidence. Today we show the public some of them. Concert of choir Acanthus, 7 Sept.